I try to brew as often as reasonable, which is usually when I’ve got a keg free, when I’ve got a competition to enter, or it’s been way too long. In 2012 it was more like every 3 months, despite wanting to brew more often. That is what makes brewing 3 times in december quite an accomplishment. This last batch pushed the 2012 total to 6 batches, 5 beers, one cider, an extract only batch, extract and steeping grains, a partial mash, all grain, and brew in a bag all grain. To say I’m a dabbler might be an understatement. One thing that hasn’t changed a whole lot is what I brew. 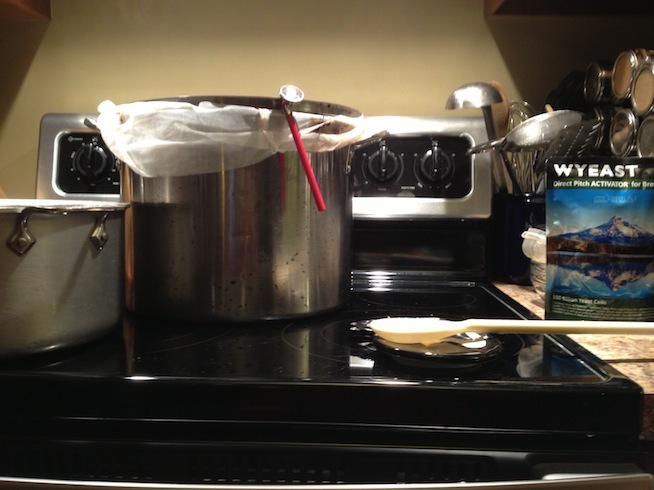 This New Years eve brew session was pretty much on a lark. I had picked up a pair of 2.5 gallon kegs from adventures in homebrewing as a christmas gift to myself. From a trip to Valley Malt this fall, I have a stock pile of grain. From stocking up during the fall harvest I also have an abundance of hops. I’ve been thinking of how to fill one of the small kegs, while taking advantage of what I had on hand. 90% of the grain, 100% of the hops, came from what I had on hand. I did still have to make the trip to the home brew shop to pick up yeast, and a few misc things, but it was a little easier on the wallet. I only needed caraffa II, lactose powder, and yeast. Anyone guess what I brewed from the ingredients I picked up? Since kicking the Oatmeal stout, I’ve wanted to brew something dark to go beside the pales I usually brew, and have on tap. My wife likes stouts more than my typical beers. I wanted this to be smoother, richer, than the last stout. In an attempt to smooth this out, I modified the recipe I based my beer off. 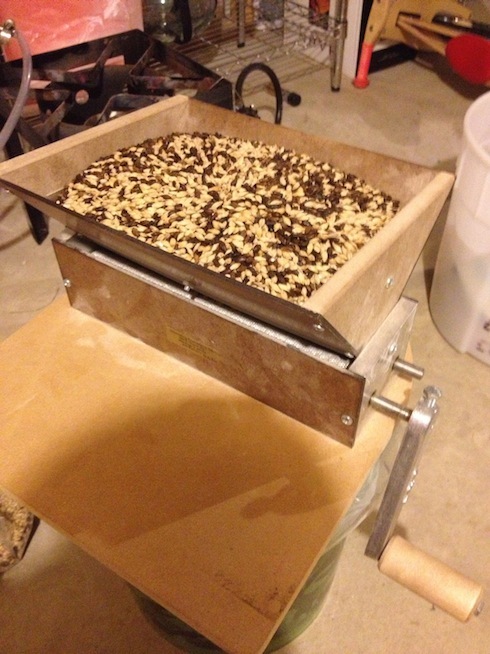 I swapped out the Roasted Barley, thinking the chocolate malt I have is going to have that edge, and roasted bitter flavor, I swapped the barley for carafa 2. I realize that some might argue that it’s not a stout if it doesn’t contain roast barley, well, it’s going to be a lactose porter then. Trust me it’s dark enough, and I’m confident it’s going to have enough bitterness to match the sweetness. 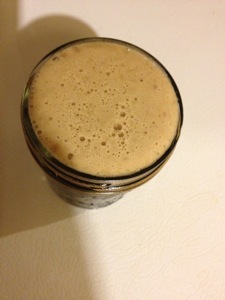 I also plan on dosing the stout with some cold brewed coffee, and a vanilla bean in the keg for added complexity. Since I was brewing a small batch, I decided to simplify my brew day, keep me from lugging all my equipment up from the basement, and allow me to stay out of the cold, I decided to brew in a bag (BIAB). It’s an all grain technique in which you take all of your brewing water, heat it to strike temp, add the grain to a large mesh bag, and add it to the pot. After 60-90 minutes you remove the bag and grain, and are left with your pre boil wort. 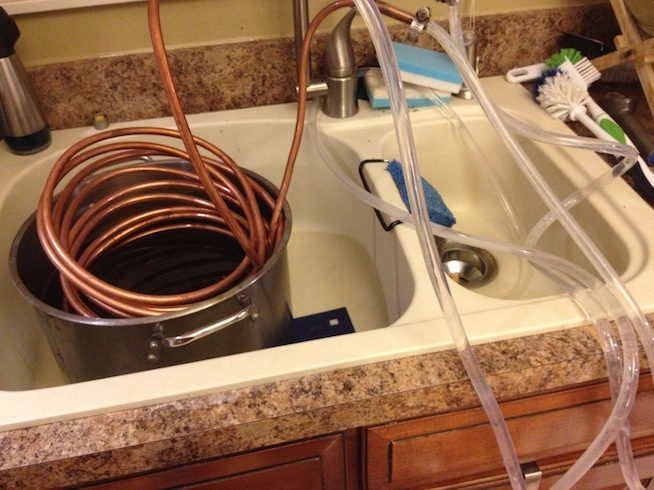 It’s less efficient than other brewing techniques, but it’s far simpler. Even for this 3 gallon batch my 5 gallon pot is a little undersized. I had an overflow trying to get the grain bag into the pot. After bailing some water, I got the mash started. I struggled to keep the mash temp in the high range (156) to keep body, and a richer beer, even keeping the burner below the pot on low. The thermometer read 150ish most of the time. Removing the large bag of grains from the 5g pot was also a bit of a chore, trying to prevent a big mess while draining wort from the grain. I rinsed the grain in my 8qt pot to get some additional extraction, because I was planning on topping up the pot anyway. The boil was uneventful, with our large 3 ring burner, I can get a boil pretty quick. Skimming as it came to a boil, and after hop additions kept the foam at bay from a boil over. As you can see above, I can barely fit the chiller into the pot, but with the cold temps, it chills quite rapidly. I chilled to 65, poured the wort into the fermentor and pitched wyeast 1028. I was really hoping to use 1099, as it’s less attenuative, and more temperature tolerant than the 1028, but the local shop was out. I checked the fermentor tonight, and it’s slowly bubbling away. Update: Beer stalled out around 1.030 if you consider the 5 points for lactose, that’s still about 10 pts too high. I should have pitched dry us05, but I decided to keg and deal with it.